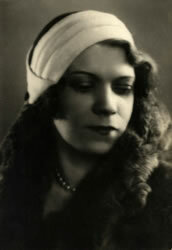 Irma P. Jaunzem was born on September 27, 1897 in Minsk. concert work as a member of a small group, which also includes: the young Vladimir Horowitz and Nathan Milstein. About those lean years, Irma remembered this way: "The food problem to some extent accelerated the final solution to the problem of my role. Together with my sisters, I went to the Belarusian villages to barter our underclothes belongings for food. And from there brought untold wealth - roughly about hundred Jewish and Belorussia folk songs. Among them Makhateyneste Mayne.